Iranian President Hassan Rouhani said today that the Iranian people elected him to change the country's foreign policy and shift away from the bombastic style adopted under his predecessor, Mahmoud Ahmadinejad. Rouhani said his government would adjust its tactics to reach out to world powers, while retaing its principles. 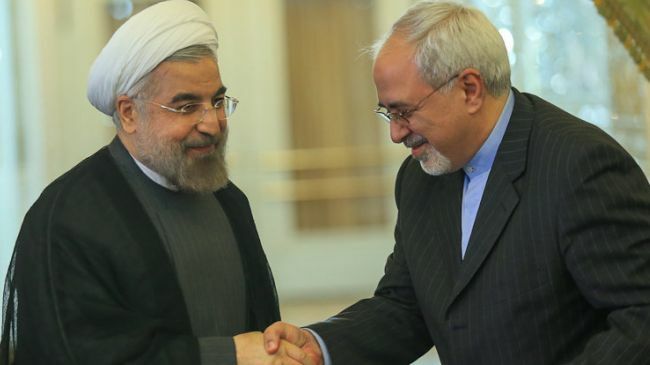 Rouhani made the comments during the swearing-in ceremony of his new foreign minister, Mohammad Javad Zarif. Hopefully this means an end to those damnable "Marg Bar" chants. A-F You seem to be either ignorant of the facts or in total denial. The foreign policy of Iran is decided by Khamenei. Salehi was the "pado" ! I agree with your statement that the Iranian foreign policy is decided by Supreme Leader Khamenei, therefore your characterization of me is an ignorance of facts that Supreme Leader's decisions regarding foreign policies, were and will oblige the new administration too. I believe that there will be a continuity of Supreme Leader's strategies in relation to foreign issues. It is worth to analyze previous Rouhani's statements that point to strategies that one can negotiate and simultaneously achieve advances in domestic goals. Argument that during previous 8 years there were no significant sanctions is naive because there was different stage and results of nuclear development and the West assumed that temporary suspension and agreement for self restrictions will be permanent ones. Once the regime stops those "Marg Bar chants" it will come crashing back onto its head.They must maintain those "Marg Bar" chants! The supreme leader is the executive head of state. But the thinking that he alone decides all important issues, including foreign policy, and all other actors, including the president (i.e. prime minister) and the foreign minister, are just puppets is naïve. Foreign policy is formed by all actors with responsibility on the subject, knowing the general principles, and of course needs to be eventually approved by the supreme leader. Is not that he sits in a room by himself and writes the policies and others execute it, doesn’t work that way. Elections have consequences, and with Rouhani/Zarif team in power, the supreme leader would defer to them to start serious and consequential negotiations with the West, not like the wasting-time strategy of Ahmadinejad/Jalili team, as Rouhani had promised during the campaign and won the overwhelming support of the voters for that policy. Of course the extreme right in Iran and in the U.S. will create many obstacles trying to stop normalization of relations between the two countries, so the negotiations will not be easy process and success is not guaranteed. But the people elected Rouhani to try it. your response to @8:11pm is a JEWEL of sorts [i wish you did it in capital letters] .you have come down to the reality and put the Leader at his right position .MAY the almighty bless you for this HONEST and truthful description on the dynamics of the establishment. -How then do the devil stray you easily by portraying the Leader as a Dictator[which is not] and yet it is open as you say it clearly that the Leader plays His part and leaves the other part to the President as stipulated in the constitution?. May the Almighty have mercy on you oh! Uskowi for writing such a beautiful response deserving to be on gold! and may He[the Almighty] purify your soul and guard you against the cursed one so that you may give your readers pearls and jewels like this one. THIS IS WHAT is expected of you!! !-WHY do you get lost then? May the Almighty give you an iota of intelligence, so you stop writing these incoherent comments. Amen ! Do you really believe in the first sentence that you have written? "The executive head of state" ! He is much more than that and you know it. I do not belong to the category of people who believe that the recent Iranian presidential election was staged, but there are quite a few signs of it being "engineered" to allow someone like Rohani to be elected as the current leadership of IRI have realized that they need a new start and approach toward the west with the sanctions putting an immense pressure on the country. I do admit that there are different centers of influence in the IRI but the ultimate final decision on these matters rest with Khamenei and depending on the different existing Geo-political factors, he afford his associates some leeway and room for manouver. He was worried about a military confrontation after the invasion of Afghanistan and Iraq, hence he backed under the pressure and gave Khatami and Rohani his blessing to negotiate with the west. Unfortunately Idiots like Bush and his Neo-cons blew it. The Americans got caught in the mess created in Iraq and Afghanistan and Khamenei and co used the time to advance the Nuclear program and to enhance the defense capabilities of the Iranian military during those years. and now it starts all over again. But I maintain that HE is the sole decider of the direction of the Iranian foreign policy and depending on the existing complex realities he directs his aides to execute his wills. There would be a need to monitor continuously and to state clearly, which hawks have to be blamed in case of any dificulties?. From previous articles I have noticed, that some authors prepare themselves to blame (divide) system of the Islamic Republic...for possible "difficulties". However, the Islamic Republic has got unexpected relief, because the current Egypt's situation undermines the strategies of Iran's enemies....,apparently for a longer time. Yes, your conclussion that the election was engineered is a very close one. In the important country, where 686 candidates had wishes to lead the country, someone had to make proper evaluation of their skills and abilities. The Guardian Council prepared list of candidates, who never held that office but who could bring new ideas and improvements...of course there was no practicallity that larger number of them could run, and the the lenght of the debates of those candidates, who were selected, exceeded intelectual levels of the debates in other countries of the West. Because the enemies made their bets on claims of frauds and a possibilities of disturbances; wished by "James" among others, the Council anticipated that they (enemies) may get their chance if Rafsanjani and Ahmadinejad's camps will compete, therefore their candidates were disqualified for the good of the country, as well as for other legitimatte reassons...in those specific international circumstances and dangers. I have meant Supreme Leader's decisions as a substitute for his guidelines. His fatwa that a possession of nuclear weapons is a sin, is an example of obligatory decision and a guidance for others.. Regarding current foreign policies, the Supreme Leader has outlined his guidelines that any contacts or negotiations with (opposing) other side should be based on a logic and that the other side have to demonstrate its commitment to the logic, before any agreements will be possible. So there are those two points to which different ways can lead and which can be "invented" by the new administration...and how they do it, it is up to them. United we will stand and shall overcome !! !